The 24th brand to launch on 15 Network, Flog it Bingo offers yet another platform for players to play, have fun, and win some bets to grow their money. They are offering a bonus of 500 free spins on sign up which you can claim when you join. 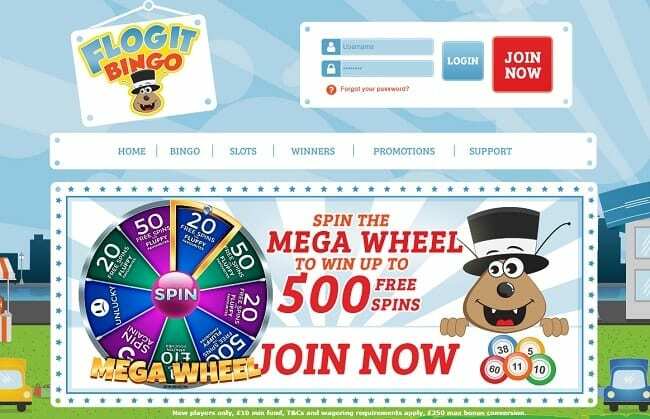 MEGA WHEEL UP TO 500 FREE SPINSNew Customer Offer. T&Cs Apply. 18+. Please Gamble Responsibly. Why not try out Flog It Bingo now to see what's in store for you? It comes with some unique features designed to offer convenience and make playing flawless. This platform comes with a neat and easy to navigate interface with a very straightforward homepage. Registering for an account is easy and fast, and you can be in and playing bingo in minutes, just as soon as you have made your first deposit. When you want to play, the site redirects you to a neat page with a drop-down menu with tabs labeled 75 ball, 90 ball, jackpots, free bingo, instants, and video bingos – you can hover over each tab to see information such as the jackpot amount, the number of players in the rooms, ticket price, and period of game, among others. Clicking any of these tabs directs you to a room playing that particular game. The rooms are equally neat, with the tickets at the right side of the screen and the chat room on the left side. Details such as your current balance and instant win games are also located on your left. Flog it Bingo demands that you fund your account before playing – the minimum start-up deposit is £10. Financing your account is easy and the information required does not in any way expose your finances’ security – it is done through credit and debit cards. Like many other gaming platforms on the 15 Network, Flog it Bingo runs on Jumpman Gaming software – a compact and flawless online gaming platform. This ensures that the games proceed without any hitches and guarantees the utmost transparency. Currently, this gaming platform only offers two versions of Bingo – the 90 ball bingo and the 75 ball pattern. However, some expansion is expected as time goes by, seeing as it is still a relatively new gaming platform. Although the platform does not offer free gaming, the initial deposit is affordable for everyone. Overall, we think you will love Flog It Bingo. There are so many games and features to enjoy along with some fun promo codes and other bonuses. Make sure to sign up today for more games.